The 18-year-old midfielder, who has impressed since breaking into the Rocks team last season, will have a week to try to impress the coaching staff at Easter Road. It is the latest in a series of trials at pro clubs Block has secured and Rocks fans have been quick to wish him well, describing it as a great opportunity for him. Hibernian are currently eighth in the Scottish top flight. They are managed by Neil Lennon. 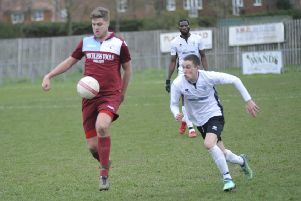 Block was first lining up for the Rocks - for whom he has been filling in at centre-half during an injury crisis - at home to Wingate and Finchley in the Bostik premier.